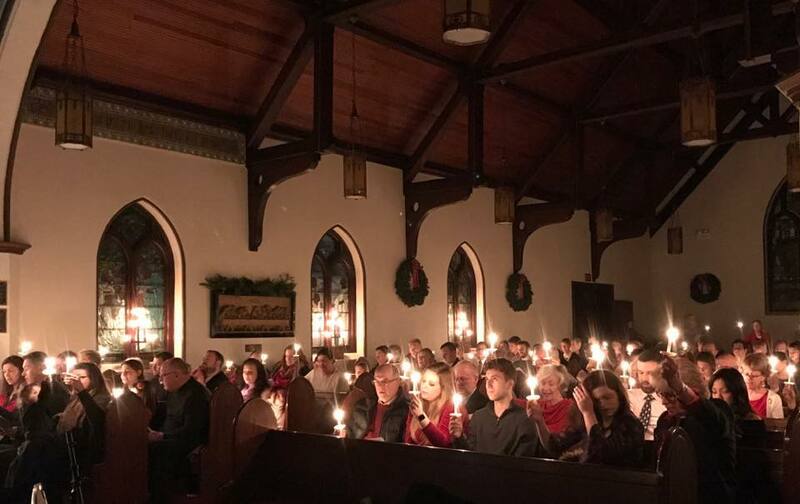 Advent and Christmas season are some of the most joyous times in our wider community and at The Briarcliff Congregational Church. At our church, we celebrate the weeks leading up to Christ’s birth with special events, as well as added elements during our regular Sunday worship including lighting of the Advent wreath candles, representing hope, love, joy, and peace. We prepare the manger week by week, our children and youth sing Christmas carols, and we delight in many more joyous surprises! Take a moment from the hustle and bustle of the holiday season to worship with us during the Advent season. Decorate the church with Christmas decorations and greens. Join us to kick off the Advent season at The Briarcliff Congregational Church! A long-standing tradition at The Briarcliff Congregational Church as a way to give back to the community during the holiday season. Ornament tags are hung on the tree suggesting particular gifts for families in need. Church members are encouraged to choose ornaments, purchase the specified gift, and return it to church. Each year, gifts are donated to specific organizations. In the past, Briarcliff Congregational Church recipients have included families at For All Seasons, Hope’s Door, Ossining Food Pantry, IFCA, and Ossining Children’s Center. A family favorite tradition at The Briarcliff Congregational Church! Bring a friend and spend some time making crafts including marshmallow snow people, Christmas ornaments and presents for loved ones. There are crafts appropriate for all ages! A light brunch will be provided. Join the New Westchester Symphony Orchestra for the annual Messiah sing-along. The two hour Messiah program will include the complete choruses and select arias. Help make festive bags of cookies for members of the church who might appreciate a little extra cheer or attention. Held at the home of a member, it is recommended that you bring three dozen cookies, preferably homemade, to be mix and matched with other cookies and packed into new bundles of Christmas joy. The Briarcliff Congregational Church invites you to a quiet holiday service of reflection. This service is an opportunity for folks experiencing loss or grief during this holiday season to step out of the Falalalala frenzy of our culture and enter into the quiet presence of God’s love. Family, friends, neighbors are all invited, so please spread the word. Light refreshments will be served in the Eastman Room following the service. Choirs and soloists will be sharing their talents as we celebrate the season in song. Come celebrate the joy of Christmas through music during the worship service. A new story to welcome our Savior into the world, told through the eyes of Ephraim. The children of BCC will offer us a new look at the story of Jesus’ birth. Bring your family and friends to this beautiful and interactive telling of the nativity through puppetry, dance, and song. We celebrate the joy of Christmas and Christ’s birth with two services both in The Briarcliff Congregational Church Sanctuary.